To improve your Push Ups, you’ve got to actually practice doing them. The problem is…So many of us do them wrong to start! We have poor form and don’t engage the correct muscles so we are stuck at a modified variation FOREVER. Or we try and progress too quickly and then get caught up on doing harder variations even though our form is incorrect and we really aren’t getting the most out of the movement. Below are 5 quick tips to help you improve your push ups! 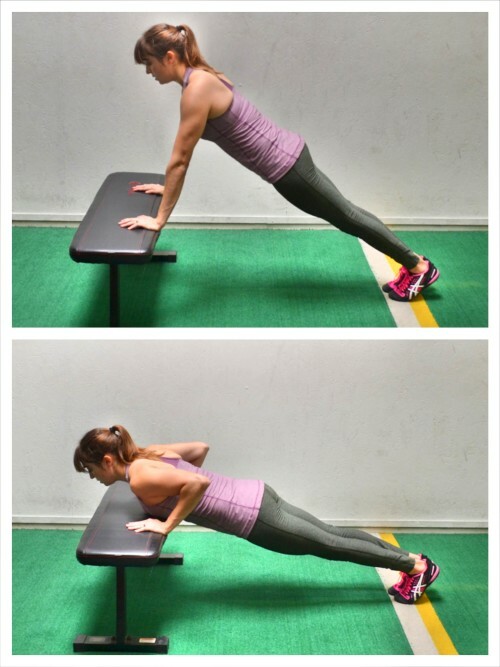 Strengthen Your Core – I say this all the time, but I’m going to repeat it again because it is essential to remember…Push ups are just a moving plank! If your core isn’t strong and engaging correctly, your hips will sag and your push up will look more like you’re doing the worm than a sleek and graceful upper body and core exercise. You’ve got to first work on strengthening your core and making sure it engages correctly during the entire push up movement. This means you’ve got to work on your planks. You’ve got to work on engaging your back, not shrugging your shoulders, bracing your abs, engaging your quads and even squeezing your glutes. 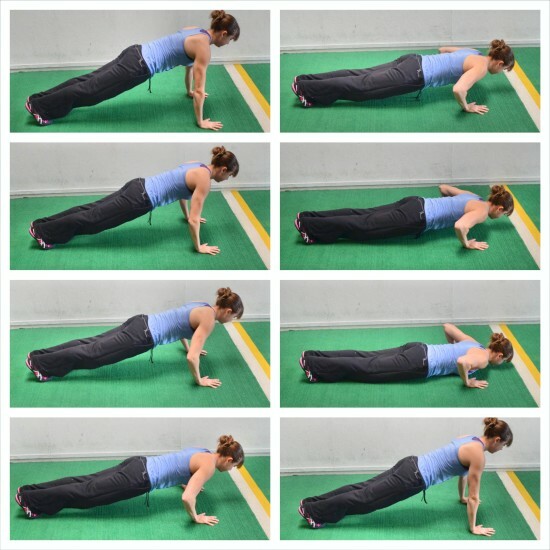 So if you want to strengthen your push ups, you should include planks in your workout routines where you focus on really engaging and activating your core! 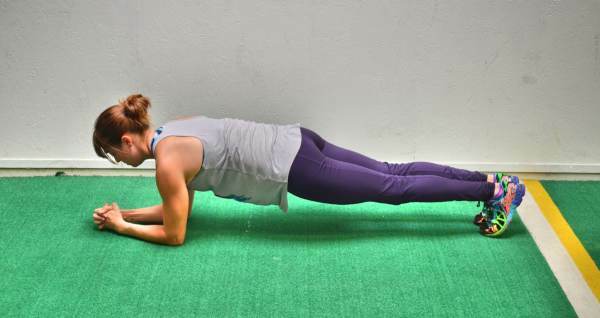 Here is a great tutorial on Plank Form and 3 Tips To Improve Your Planks. Another great way to build your core strength is to use Incline Push Ups because Incline Push Ups are a way to modify the push up while still engaging your core in the same way as a full push up. Learn more about Incline Push Ups below! Activate Your Back – Push ups do focus on your chest, shoulders and triceps. But that doesn’t mean you don’t need to get your back activated and working correctly if you want to do a proper push up. Getting your back muscles activated and working correctly helps stabilize your shoulders and mobilize your shoulder blades to prevent shoulder injury during push ups. Getting your back and your serratus anterior (the muscle on the sides of our ribs under our chest and in front of our lats) activated and working will not only prevent injury but also improve your pressing strength! To do a Scapular Push Up from your hands, set up in a high plank position with your hands under your shoulders and your feet together. Your body should be in a nice straight line from head to your heels. Without bending your elbows or dropping your hips, pinch your shoulder blades together and press your chest out. Do not tuck your chin or jut your head forward. Also do not let your core wiggle or your elbows bend to try to increase your range of motion. You are not doing a push up. This is a very small range of motion where you are simply focused on pinching your shoulder blades together. Just pinch your shoulder blades together and then relax or even round your back up out of it (rounding your back at the top is another variation but can be very useful for correcting certain push up problems). Keep your core tight as you pinch your shoulder blades together. 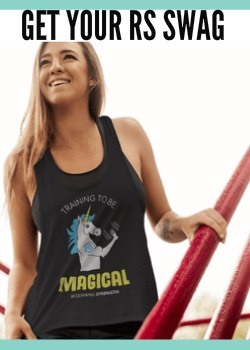 As you get stronger and build the mind-body connection you will find your range of motion increases. If you struggle to pinch your shoulder blades together without wiggling your core or bending your elbows, go down to your knees as if doing a push up from your knees or even come into a quadruped position to start. You can also do this against the wall. Just focus on mobilizing your shoulder blades! Another push up variation I recommend to activate and strengthen your back and serratus anterior while mobilizing your shoulder blades and strengthen your core and upper body is the Push Up Plus! You may see what I call the Scapular Push Up also called the Push Up Plus, but the Push Up plus I’m referring to is very different. This move is very focused on engaging the core and working to mobilize your shoulder blades. To do the Push Up Plus, you’ll first perform a full push up. I recommend if you can’t do a full push up from the ground that you do this off an incline so you can really engage your core at the top. Perform a push up and then, at the top, round out as if performing the “cat” stretch. Draw your belly button in toward your spine and perform a pelvic tilt, tucking your hips under toward your ribs as you round your back. You want to hollow out your belly and your round your back out. You should feel your back stretching. Then return to the nice high plank position and feel your shoulder blades go back to neutral before you perform another push up. While at the top of the push up, even feel around your rib cage under your armpits engaging to help stabilize your shoulders. You should even feel this if you think about it throughout the entire push up motion. Use Incline Variations – The Incline Push Up is a must-do push up variation if you aren’t yet able to perform a full one with perfect form. While I use the Knee Push Up and am not against that variation, I do believe if you’re stuck unable to progress to that first full one, it’s because you’ve only been doing push ups from your knees. Plus the Knee Push Up, may actually be too hard for some people to start. It may cause you to develop bad habits. 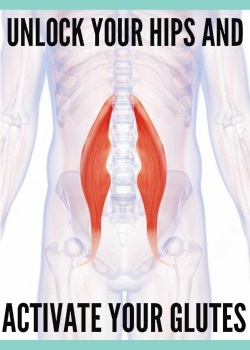 You may find you tuck your chin or your elbows flare way out or your core still sags. You may see this in your clients even. And this can be another reason to modify with an incline. It does give you more control and allows you, or your clients, to learn proper form with the right amount of resistance. 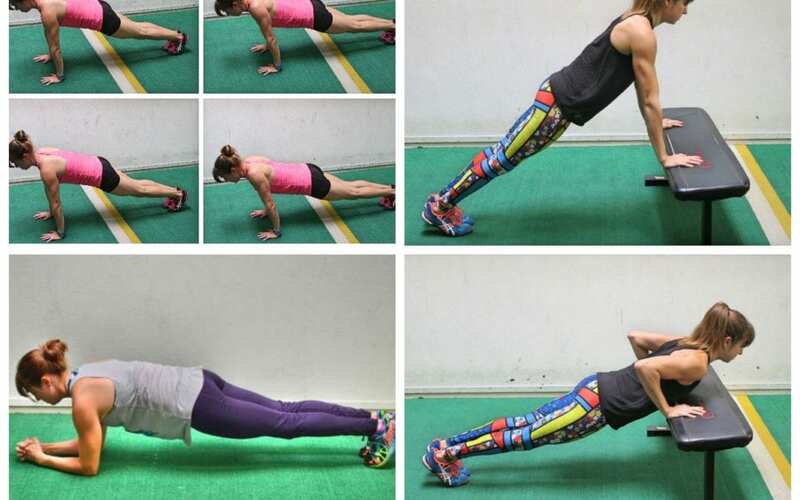 When you do push ups from your knees you do build upper body strength and you are working on your core strength; HOWEVER, you also never force yourself to take on your full bodyweight or engage your core in exactly the way you have to do a proper full push up. With the Incline Push Up, you are working your core and body in the exact form you will with a full push up from the ground. It is also very easy to slowly progress. As you get stronger, you can slowly lower the incline even just ever so slightly each and every workout! Use Eccentric Variations – If you want to build strength and take your push ups to the next level, you also need to do some Eccentric Push Ups. What this means is you need to do Push Ups where you focus on a slow lower down to the ground. By slowing down the lower down, you can challenge your muscles even more. You can build core strength while challenging your upper body further. If you can do a full push up, this is a great tool to use to be able to do more push ups and even more challenging variations. And if you can’t yet do a full push up from your toes yet, this is a great way to help yourself progress toward that first full one and start taking on your full bodyweight. Often before you can do that first full one, you can at least handle your own bodyweight for part of the movement. Which is where the Eccentric Push Up comes into play. By taking on your full bodyweight for a slow lower down, you are building upper body and core strength. You are learning to engage everything correct with perfect form even if you can’t push back up. So if you aren’t yet at that first full push up, try doing just an Eccentric ONLY Push Up. To do Eccentric-Only Push Ups, set up in a high plank position with your hands outside your chest and your feet together. Your body should be in a nice straight line. Keeping your body in a nice straight line, slowly lower your chest down to the ground. Try to slowly lower down for at least a 3 count if not a 5 count. Keep everything engaged until you touch the ground. Here you can release and relax onto the ground and then reset. You do not need to push back up. Simply reset at the top. Your focus is on perfect form for a very slow lower down. At the bottom you can release and simply reset back at the top. 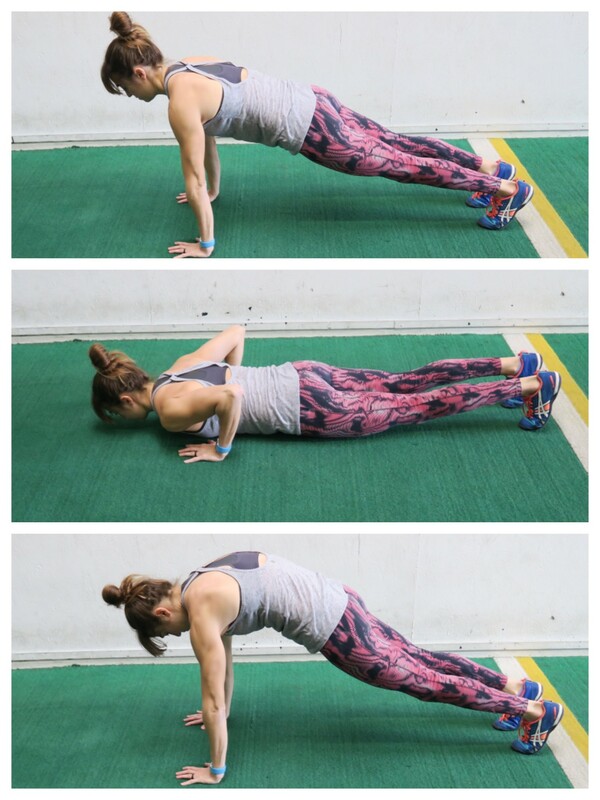 By just doing this slow lower down, you may find you are able to build toward that perfect full push up even when you feel like you’ve been working forever with other modified variations! Its all about constantly challenging yourself and finding ways you can do as close to a full version as possible! Mix Up Your Grips – We’ve all heard the phrase, “You’re only as strong as your weakest link.” Well the same is true with push ups. If your shoulders are weakest, triceps are weakest, chest is weakest….WHATEVER is weakest that is what will limit how many push ups you can do. That is why it is important to include a variety of push up “grips” in your workouts. Do some close grip, some wide grip, some pike presses so T Push Ups…include a variety of hand placements and even movements that focuses on certain areas. 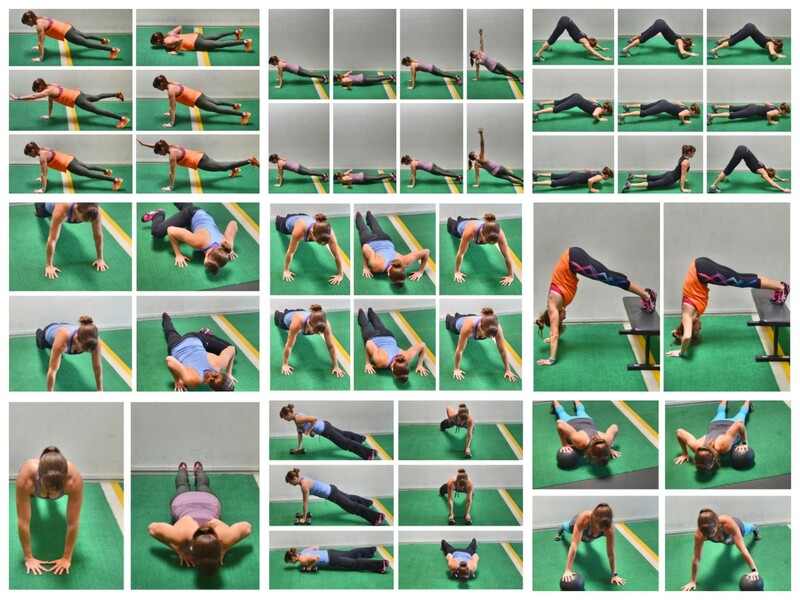 There are so many push up variations out there you can use to target your upper body and core in different ways to strengthen your weak points! 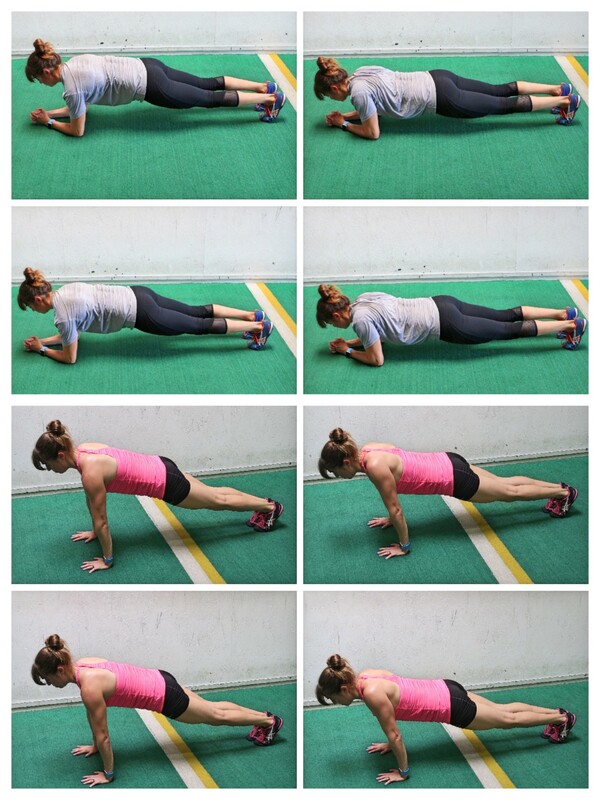 Here are 31 Push Up Variations you can check out to help you! Ready For Workouts To Improve Your Upper Body Strength, Especially Your Push Ups? 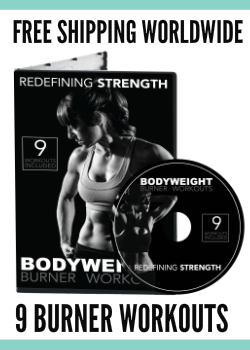 –> Check out my Arm Burner program and WORKOUT CARDS!